Have you recently attended one of our programs? Help us improve the quality of our programs by filling up our quick evaluation survey: Mt Tam State Park Program Evaluation. Thank you so much for your feedback! Junior Rangers at Mt Tamalpais State Park! Every second Saturday of the month, 3-4pm, from April to September. Meet at the Pantoll Campfire Center behind the Visitor Service Kiosk. 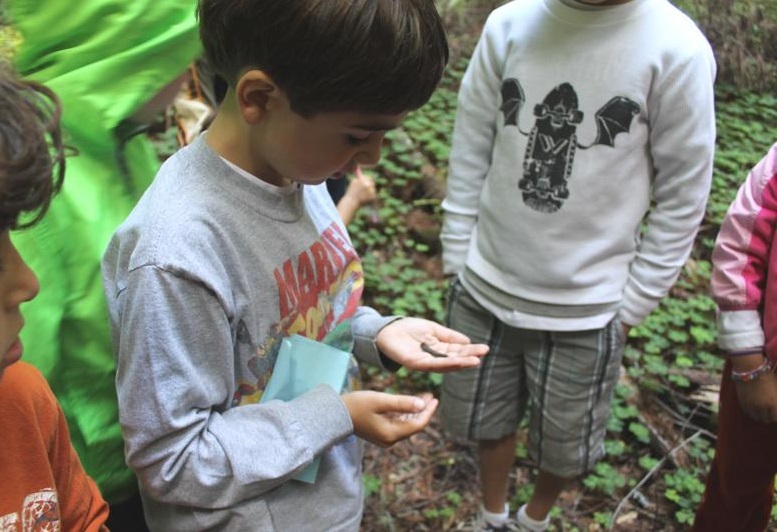 Play games, make art, and hike to explore the plants, animals and history of Mt Tamalpais State Park during this 1-hour program for kids ages 7-12. --Sorry parents, this is a kids-only program. Leave your kid(s) and enjoy some time on your own in beautiful Mt Tam! Kids will have a good time and earn rewards for the Junior Rangers program. At their first program they will receive a logbook and badge. For each activity they will earn a stamp in their logbook, and as they go through the program they can earn prizes. The event is free; parking is $8 and supports the parks. Enjoy outdoor exercise while learning about the cultural and natural history of the park. Hikes include a lunch/snack stop. What to bring: Come prepared. Wear good hiking shoes/boots. Bring plenty of water, lunch and snacks. Hiking poles are recommended on this mountain. Participation: Hikes are limited to 20 people per leader. First come, first serve. Be on time to allow for parking and meeting with your group. Cancellation policy: Rain or winds above 30 mph cancel (unless otherwise advertised). Pet policy: Service animals are welcome. No other pets are allowed on hikes unless the hike specifically says that it is "Dog Friendly". On dog friendly hikes, only two dogs at a time are permitted on the hike. You HAVE TO obtain a permit/waiver from park staff before bringing your dog(s). We advise to contact park staff at least 1 week in advance to obtain a dog on a hike permit. See details within the hike description. Our hikes rating is based on a numerical calculation that takes into consideration distance and elevation gain (Source: NPS). However, this rating might be imperfect. When choosing a hike, always consider the specific elevation and distance in addition the the given difficulty rating. Easy: A hike that is generally suitable for anyone who enjoys walking. Mostly level or with a slight incline. Generally less than 3 miles. Moderate: A moderate hike is generally suitable for novice hikers who want a bit of a challenge. The terrain will involve a moderate incline and may have some steeper sections. Generally 3 to 5 miles. Moderately strenuous: Moderately Strenuous hikes will generally be challenging for an unconditioned person. The terrain will involve a steady and often steep incline. Generally 5 to 8 miles. Strenuous: Strenuous hikes will challenge most hikers. The hike will generally be longer and steeper, but may be deemed "Strenuous" because of the elevation gain. Generally 7 to 10 miles. Very strenuous: Only well-conditioned and well-prepared hikers should attempt very strenuous hikes. The hike will generally be long and steep, and may include rock scrambling, stream crossings, and other challenging terrain. Generally 8 miles and over. Join our interpretive staff in a walk among the Coast Redwoods, our state trees. On this hike we'll travel through time starting with the California Gold Rush to understand how our relationship with the redwoods have evolved. We'll learn how their biological processes have informed how we value the forest today and what role they play in the future of our planet. Distance: 3.2 miles, 712 ft elevation gain, Moderate. Kids above 7 years old with established hiking skills welcome! No dogs. Wednesday, April 3 at 5:30 PM from Bootjack trailhead. "Views from Mt. Tam" Interpretive hike with docent Catherine Orland. Weather permitting, we'll see some gorgeous views of the Bay around Sunset. We can look towards Diablo. We can look out to the Pacific. We can look back towards San Francisco and down the coast. Distance (mi): 4.6. Elevation Gain (ft): 1024. Moderate. Wednesday, April 10 at 5:30 PM. Fitness hike with docent Sue Karp. Details TBD. Sunday, April 14 at 9:30 AM from Rock Spring trailhead. Fitness hike with docent Robert Freinkel. Explore the trails of North Side Mt Tam. Search for local wildflowers and native plants. Participate in trail routing. Distance (mi): 6. Elevation Gain (ft): 1129. Moderately Strenuous. Wednesday, April 17 at 5:30 PM from Bootjack trailhead. "Views from Mt. Tam" Interpretive hike with docent Catherine Orland. Weather permitting, we'll see some gorgeous views of the Bay around Sunset. We can look towards Diablo. We can look out to the Pacific. We can look back towards San Francisco and down the coast. Distance (mi): 4.6. Elevation Gain (ft): 1024. Moderate. Sunday, April 21 at 9:30 AM from Stinson Beach Parking Lot trailhead. Fitness hike with docent Rosalind Gottfried. We will hike 7 miles at a moderate pace. Beautiful woods and ocean views, a short meditation. NOTE: There will be a sign on top of the docent car, saying "HIKE OPEN TO THE PUBLIC". Distance (mi): 6.9. Elevation Gain (ft): 1804. Strenuous. Wednesday, April 24 at 5:30 PM from Mtn Home trailhead. Fitness hike with docent Sue Karp. Enjoy an uphill hike through Redwoods on the Troop 80 trail, built in 1931 by the SF Boy Scouts. Look for spring poppies and blue eyed grass as we ascend the Bootjack trail to Bootjack Camp. Enjoy views on the Matt Davis trail as we return to Mt Home. Distance (mi): 5.2. Elevation Gain (ft): 728. Moderate. Saturday, April 27 at 9:30 AM from Bootjack trailhead. Fitness hike with docent Maria de la Fuente. Experience strength and balance in nature. As we hike we feel and look for connections between us and our surroundings. We will we challenge ourselves with climbing down a ladder and climbing up stairs and feel the gratitude of being. Distance (mi): 6.2. Elevation Gain (ft): 1614. Moderately Strenuous. Sunday, April 28 at 9:30 AM from Mtn Home trailhead. "Scent-Sational Mt. Tamalpais" Interpretive hike with docent John Cook. Mt. Tamalpais is a treasure of beautiful views and quiet places. But Mt. Tam’s fragrance is another treat for the senses. On this short walk (60 to 90 minutes), we will have “close encounters” with some of the plants that lend Mt. Tam a distinct scent. Depending on the season, we'll stop and note Douglas fir, Bay laurel, and other fragrant species. We’ll “stop to smell” these and other plants like wild lilac and coastal sage in a natural setting. You’ll never smell Mt. Tam the same way again. Distance (mi): 2. Elevation Gain (ft): 174. Easy.